Adding an aftermarket front bumper to your rig does a lot more than give it rugged good looks. 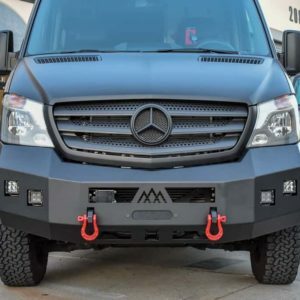 Aluminess bumpers also increase the off-road capabilities of your Ford Transit van by improving your approach angle which is crucial for getting over technical obstacles. Optional brush guards protect your front end from animals, off-road hazards, and careless drivers. They also provide a sturdy mounting point for winches, lights, trailer hitches, recovery points and other accessories.